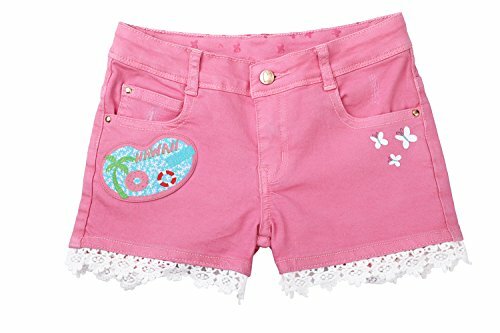 Dolcevida girl's denim twill shorts are a comfortable, stylish addition to your girl's wardrobe. Made of soft and stretchy denim for a great feel and easy to pull on, they are just what a fashionably conscience girl needs for the warm weather season. Comfortable and functional lightweight denim, perfect for school, hanging out or simply lounging around the house. Quality Constructed durable shorts for long lasting wear even after multiple washes. Breathable material provides the perfect feel, keeping her cool during the warm summer months. Perfect Fit for your little girl, stylish patch with adorable embroidery details, great for daily wear. Easy to clean after a long day, simply machine wash and dry. Please Reference the Variations for All Available Sizes & Colors! Please refer to size chart in the second picture to choose the right size if you are a first time buyer. Smaller than US Size. It is better to order 1~ 2 sizes up. If you have any questions about this product by Dolcevida, contact us by completing and submitting the form below. If you are looking for a specif part number, please include it with your message.